Pipette.com offers some of the best prices and widest selections of 384 Well Plates available. 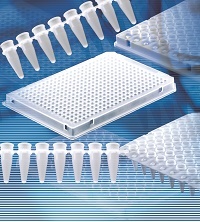 Pipette.com carries 384 Well Plates from Eppendorf, Simport, Scientific Specialities, Brandtech, CAPP, Excel Scientific, Heathrow Scientific, Pipette.com and NEST, providing you with the opportunity to select the right 384 Well Plates for your lab. Check out some of the key features and benefits of some of the best selling and most popular 384 Well Plates below. Capp Expell 384 well plates are made of a special blend of PP, designed for PCR and qPCR applications. The evaporation rate is less than 3%, enabling processing PCR volumes as small as 5 µL. Capp 384 well plates can be used in all standard 384 well cyclers as well as in many 384 well block (q)PCR cycler models. Expell 384 well plates are also ideal for robotic applications, enabling high-throughput and low-volume processing. Ultra-thin walls produce efficient thermal transfers during amplification. Barcoded semi-skirted and full-skirted plates enable convenient sample identification and tracking throughout analysis. Capp Expell 384 well plates are made of a special blend of PP, designed for PCR and qPCR applications. Evaporation rate less than 3%, enabling processing PCR volumes as small as 5µL. Simport AMPLATE Raised Rim Thin Wall PCR Plates, AMPLATE 384 Wells Flex Plates. 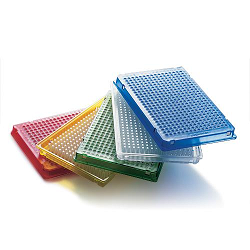 Amplate™ Raised Rim thin wall PCR plates are the latest additions to the wide range of PCR products. 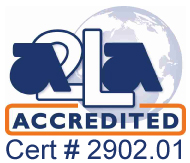 Offering just the right rigidity for automation, these three 384-well plates, made in a standard 8 x 12 configuration, are perfectly suited for high performance thermal cycling. UltraFlux Full-Skirted 384-Well PCR Plates with Ultra -Thin Walls.